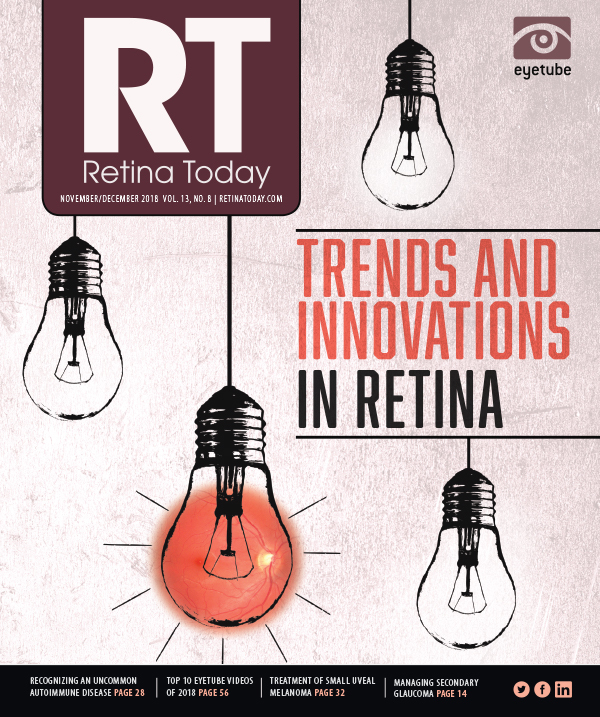 Intravitreal highly concentrated triamcinolone may offer an inexpensive alternative to sustained-release implants, but not as a first-line option. Cystoid macular edema (CME) is an important cause of central vision loss. CME is the endpoint of a variety of conditions such as diabetic retinopathy, retinal vascular disease, and ocular inflammatory diseases. • Management of CME typically involves intravitreal anti-VEGF injections or sustained-release corticosteroid implants, both of which have pros and cons. • The authors conducted a trial of intravitreal highly concentrated triamcinolone for the treatment of CME in patients with poor response to anti-VEGF injections or those who were unwilling to continue receiving anti-VEGF injections. • According to the authors, highly concentrated triamcinolone can be a low-cost and relatively simple treatment for CME, but is not a first-line option. Management of CME often involves intravitreal injections of anti-VEGF agents or sustained-release corticosteroid implants. Anti-VEGF treatment necessitates monthly or bimonthly injections that can be expensive and burdensome for patients. Sustained-release corticosteroid implants, although they are effective and require less frequent administration, are expensive. Intravitreal injections of either 2 mg or 4 mg triamcinolone acetonide can also be effective, but the effect usually lasts only 3 to 4 months, and the preservative present in some formulations can cause inflammation. In addition, any steroid can cause cataract and increased IOP. Attracted by the low cost of HCT compared with sustained-release corticosteroid implants or anti-VEGF drugs, as well as the convenience of less frequent injections, we undertook a trial of HCT for CME in our eye hospital, KMN Eye Care, in Jakarta, Indonesia. After approval by our medical committee, we offered HCT to patients with CME who either had a poor response to anti-VEGF injections or did not wish to have more anti-VEGF injections. To prepare HCT, an entire 40-mg vial of triamcinolone (Kenalog-40, Bristol-Myers Squibb) is aspirated into a 1-cc syringe, the needle is replaced with a sterile cap, and the plunger and flanges of the syringe are removed (Video). 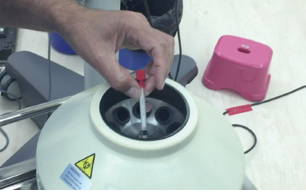 The syringe is then placed in a centrifuge. After 30 seconds at the highest speed, the syringe is rotated 180° and centrifuged for another 30 seconds. The supernatant is discarded, and the remaining pellet of triamcinolone is prepared for intravitreal injection using the existing syringe. Under aseptic technique, 0.1 cc of aqueous is aspirated, and the pellet of triamcinolone is injected intravitreally. Care is taken to inject into the posterior vitreous so that the triamcinolone does not adhere to the back of the lens. Figure 1. Case No. 1: Accidental intravitreal injection of dibekacin. Patient had CME with count fingers VA. One month after intravitreal HCT injection, CMT decreased from 410 μm to 89 μm with no change in BCVA. Figure 2. Case No. 6: Diabetic macular edema. CMT decreased from 553 μm to 371 μm and BCVA improved from 0.30 to 0.60. Figure 3. Case No. 17: Diabetic macular edema. 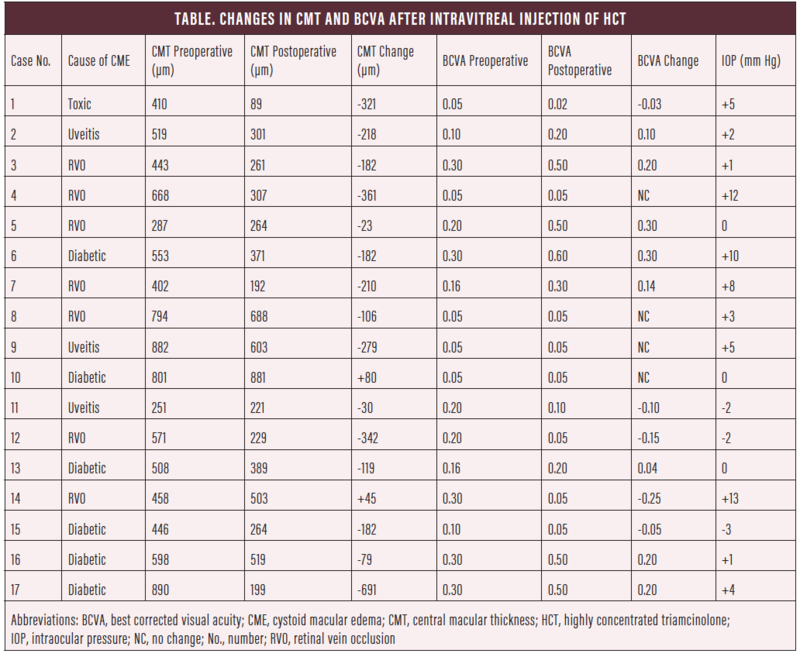 One month after HCT injection, CMT decreased from 890 μm to 199 μm and BCVA improved from 0.30 to 0.50. All patients received an informed consent form, and the risks involved in this off-label treatment were explained. 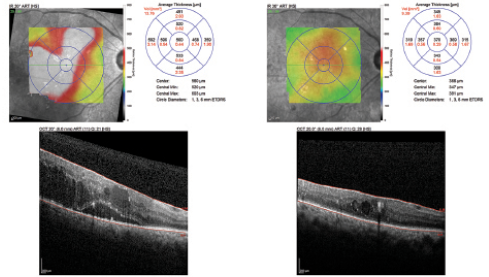 All patients had BCVA, central macular thickness (CMT), and IOP measured before HCT injection and on follow-up visits. From November 2017 to August 2018 at our hospital, 17 eyes of 15 patients were injected with HCT. The causes of CME were toxic CME in one eye, uveitis in three eyes, retinal vein occlusion in seven eyes, and diabetic eye disease in six eyes. 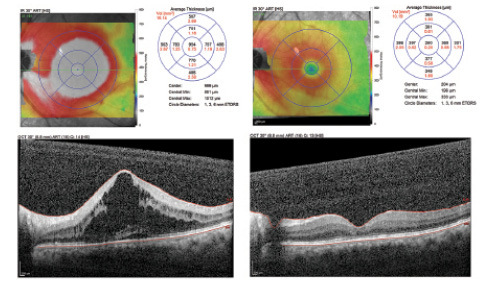 Preoperative macular thickness ranged from 251 µm to 890 µm. BCVA ranged from 0.05 to 0.3 on the Snellen decimal scale. Follow-up period ranged from 2 to 38 weeks. Results are shown in the Table below, and case examples are shown in Figures 1 through 3. In 12 of 17 (70%) eyes, CMT decreased more than 100 µm after injection of HCT. In five of 17 (30%) eyes there was less than 100 µm change in CMT. 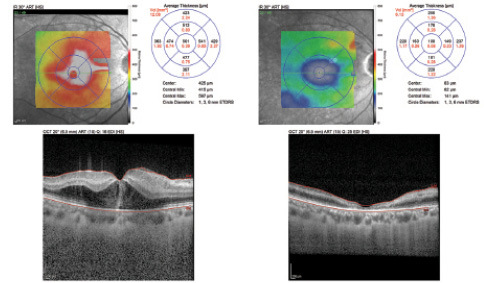 Reduction in macular thickness of more than 100 µm lasted 2 to 8 months and ranged from 106 µm to 691 µm. • Toxic CME: In one eye of a patient who had accidental intravitreal injection of dibekacin causing CME and loss of central vision, there was a dramatic improvement of macular thickness but no change in BCVA due to necrosis of the photoreceptors. BCVA improved in eight of 17 (47%) eyes, remained the same in four (24%), and decreased in five (29%). BCVA before treatment appeared to be a good prognostic indicator for improvement of vision. No case with pretreatment BCVA of 0.05 had significant improvement of vision, despite often dramatic decreases in CMT. Two eyes had sterile endophthalmitis that resolved spontaneously in 2 weeks; in one eye the triamcinolone adhered to the anterior vitreous face and obscured central vision for 4 weeks before clearing. IOP increased in eight out of 17 eyes. IOP was controlled with antiglaucomatous medications in seven eyes, and one eye needed a glaucoma drainage device. In this series, BCVA improved in 47% of eyes and macular thickness improved in 70% of eyes. Adverse events included postinjection IOP increase in 47% of patients, and in 17% of patients there was a significant event that caused a transient loss of vision. We believe that HCT can be a low-cost and relatively simple treatment for CME. However, considering the incidence of complications experienced in our series, we do not believe it should be used as a first line of treatment. 1. Malinowski SM. Slurry Kenalog: a lower cost, quick and easy alternative for long-term intraocular steroid delivery. Presented at: American Society of Retina Specialists Annual Meeting; August 11-15, 2017; Boston, MA.